As mentioned yesterday with my Pantry Makeover post, I’m trying to get more organized in the New Year. So what room do I spend the most of my time in and need the most help with organization? THE KITCHEN. 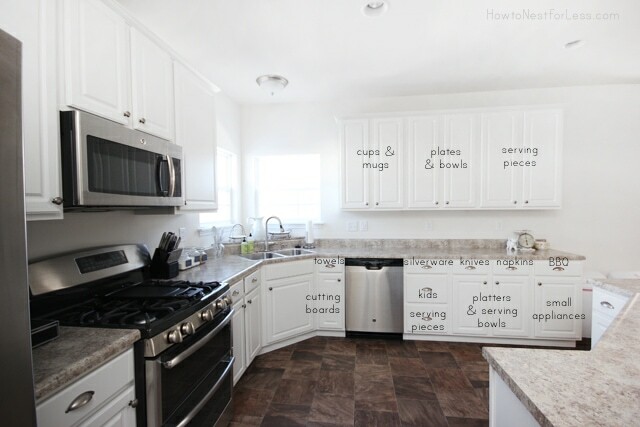 The easiest plan for me was to take photos of all my cabinet exteriors and mark on them in Photoshop what would go where. You could also do this with post it notes! I decided to break up my kitchen into zones. 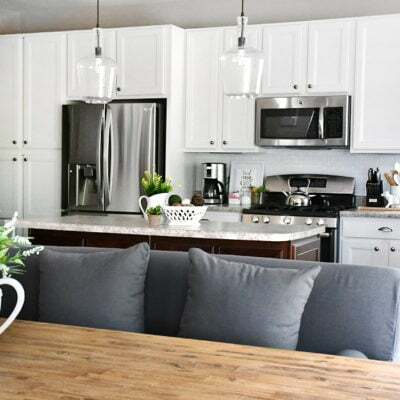 The first zone was near the dishwasher, the perfect place for my dinnerware, drinkware and silverware… everything that I used on a daily basis. 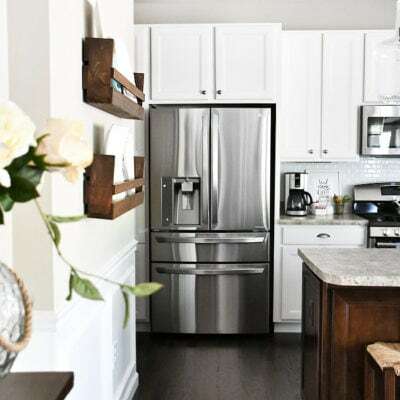 The less used kitchen items go higher on the shelves, second set of dishes, nicer mugs and drinkware, and specialty serving pieces. One of my favorite drawers on this side of the kitchen is my Kid Drawer. Plastic kid cups and plates at my daughter’s height so she can get her own glass of water or plates while I’m fixing her lunch. The side of my kitchen to the left of the sink is my Cooking Zone. Here I keep everything that I need to cook dinners, including all prep work and food storage. 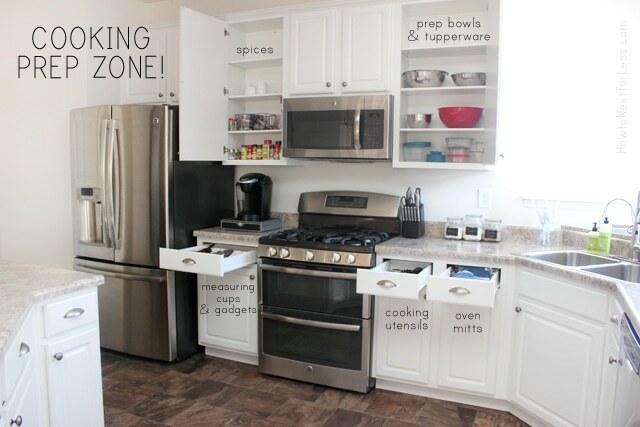 Since I have a double oven, I have a large cabinet to the right of my stove for all of my pots and pans. And as you can see, I have everything within an arm’s reach. Spices, prep bowls, measuring cups, gadgets, and all kitchen utensils. 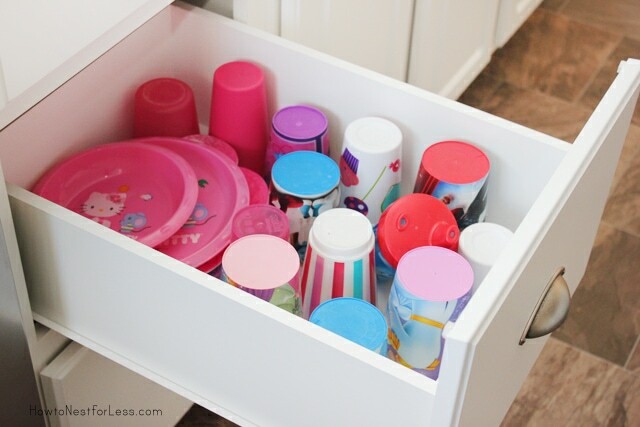 Plus each drawer is organized with handy little dividers so I can find things in a dash. 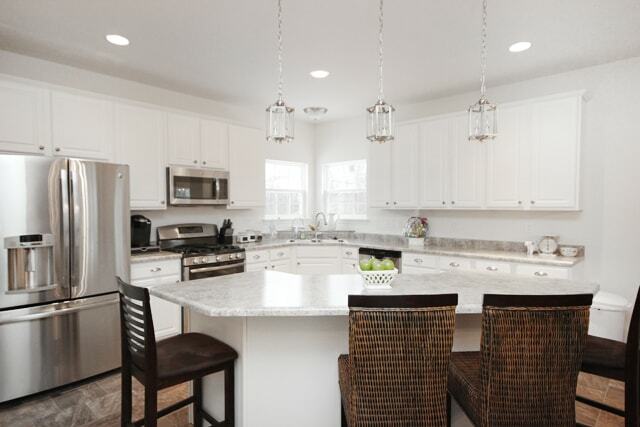 The large center island also has many useful cabinets and drawers. 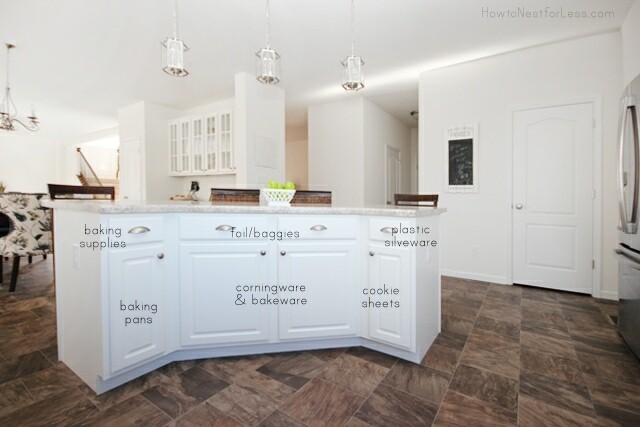 On the left side I keep all of my baking pans and baking supplies. 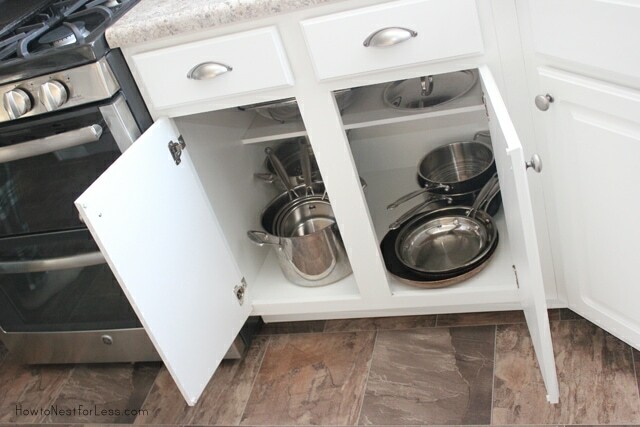 The middle cabinet holds my corningware and bakeware, plus larger appliances like my crockpot. Then the right side cabinet holds all of my cookie sheets. 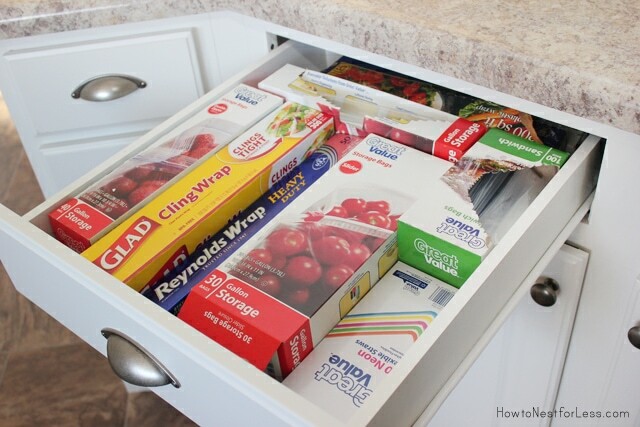 The center drawers of the kitchen island is a big helper when packing school lunches. They include foil, plastic baggies, and brown paper bags. 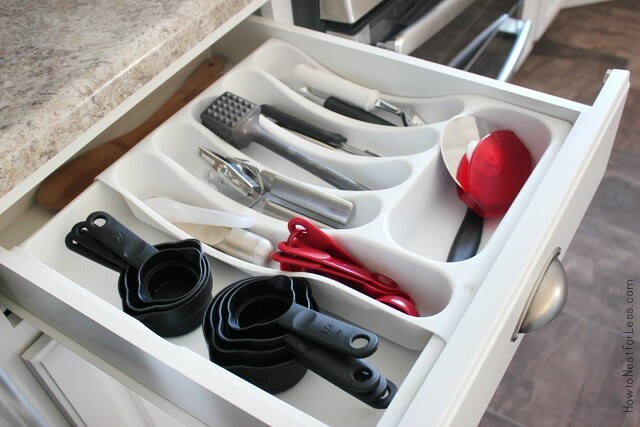 Then the drawer on the far right holds plastic silverware and napkins. Now in my last home I had less than half of the cabinets and about a fourth of the drawers I have now, but no matter your kitchen size you can make an organizational system work for you! 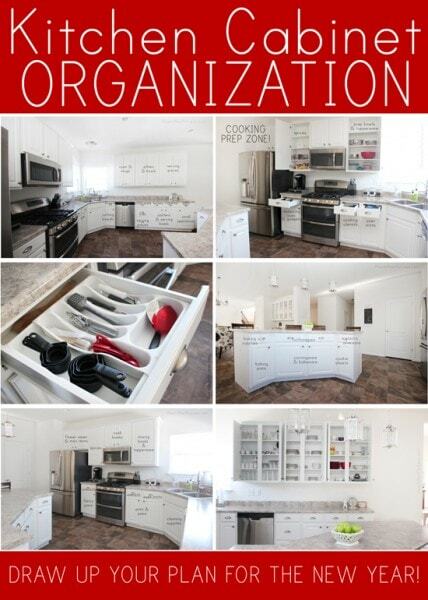 So, who’s up for the challenge to reorganize your kitchen in 2014? Have you ever made a plan of attack on organizing before? I wish I had a kitchen like that, looks beautiful! 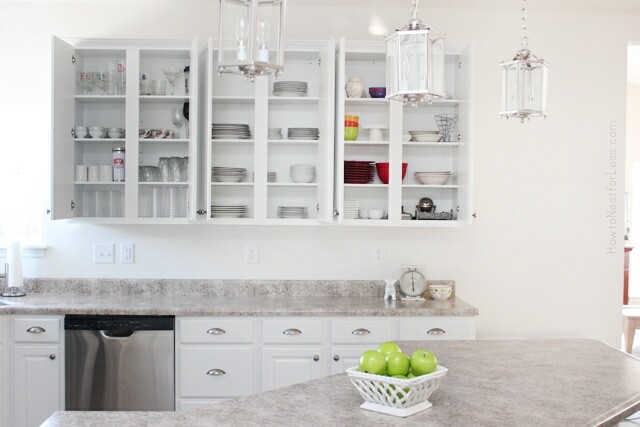 It is easier to organize when you have a huge kitchen with lots of storage like the one shown in these pictures. How about those of us who have limited space. Do you have any ideas/plans for us? I understand. I had to go thru and cut down on pots and pans..and the ones not used, but didn’t want to give away yet – put in basement storage tubs. I went thru everything in the kitchen and gave away dish sets, etc. very hard to do, but once you start it gets easier. 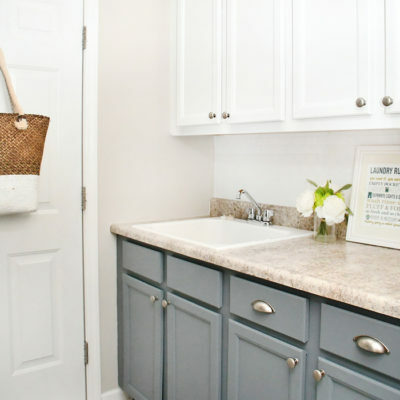 Also we had broom closet off the kitchen that my husband put in shelves and all the appliances are kept in there on shelves and the on the bottom are bins for recycling. I haven’t got yet…this is a work in progress! awesome and i am in love with your kitchen. 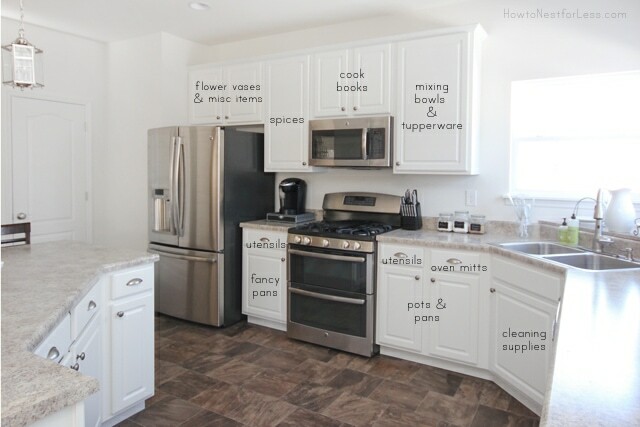 I love your kitchen and how neat and organized it is! I have to reorganize my kitchen … I have way to much stuff in my cabients and drawers! Hope you are staying warm! Thanks so much Lauren! Hope you’re doing well!! I adore your kitchen! Beautiful! I just found our site! We recently remodeled our kitchen and I have at least 2x more cabinet space and a larger pantry. 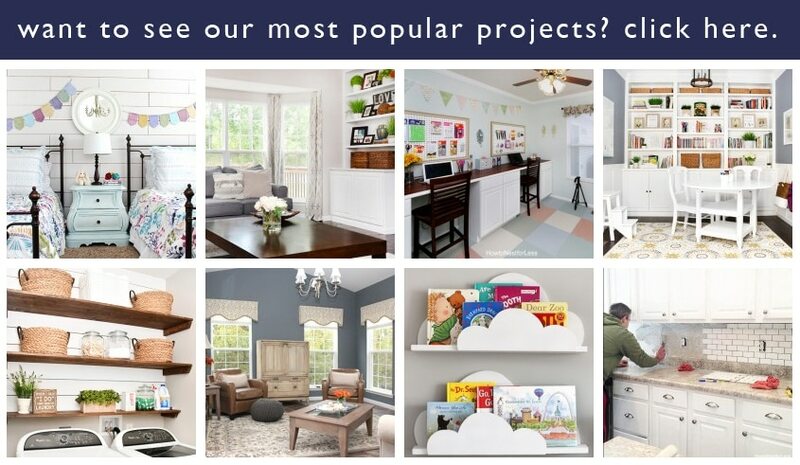 I was looking for ways to organize my new space – this is great help! Thank you! You’re welcome. And good luck with the new kitchen! Great idea to take picture and plan it out. I am on the process of organizing my kitchen to flow. Thanks for the tips.